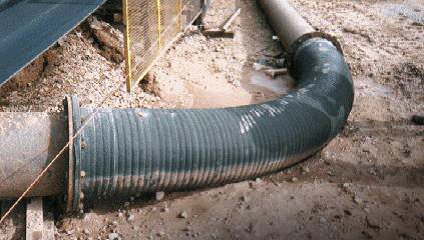 Flexiducting offer a range of Large Bore Hoses, custom made and mandrel built hoses engineered for demanding environments with built-in flanges and couplings to suit your application. 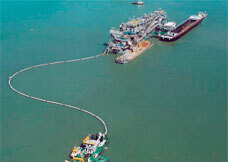 A large bore custom built Marine Petroleum Transfer Hose. 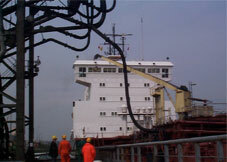 A loading and unloading petroleum suction and delivery hose for dockside use, these hoses are mandrel built Nitrile lined with a tough Neoprene cover, and are suitable for conveying crude oil and all grades of liquid petroleum products. A Viton lined hose is available for 100% aromatic content. 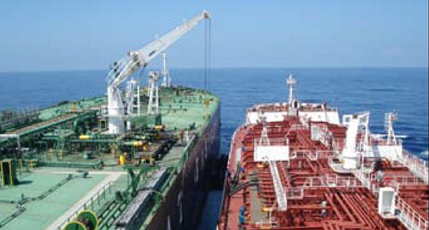 The Flexiducting Ship to Ship Transfer Hose is a helix-free crude oil and petroleum transfer hose assembly specifically designed and custom built for ship to ship oil lightering service. Made from black nitrile rubber this hose is designed to convey liquid petroleum based products with a maximum aromatic content of 50%. 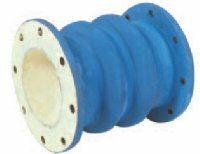 A range of custom built rubber expansion joints, bellows and connectors engineered for industries throughout the world.